Wally Lamb is one of the authors I put on my TBR list last year. While I purchased She’s Come Undone, when I saw The Hour I First Believed at Sauls Memorial Libary (my work library), I snatched it up – and am so glad I did. I’ve talked a bit about the differences in experiencing a book by listening to it versus reading it, and I’m anxious to compare Lamb in these two scenarios. OK, I’m beating around the bush. 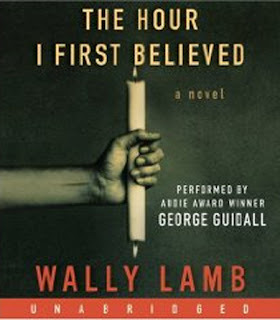 I don’t know if I fell in love with Wally Lamb, Caelum Quirk or George Guidall (the reader for the audio version), but every second of the 20-CD set was pure pleasure. The Hour I First Believed tells the story of Maureen and Caelum Quirk. She’s a school nurse and he an English teacher at Columbine when the infamous shootings occur. Caelum was actually absent on that day (one interesting subplot is meeting the teacher who subbed for him that day), as he had traveled back east to Connecticut to be with his dying aunt, his last living relative. Lamb places Maureen in the library during the rampage, and so the story begins as one of survivors’ aftermath. Maureen’s struggle to cope coincides with Caelum’s inheriting the family farm, which allows the Quirks to return to Three Rivers, Connecticut, and invites Caelum to deal with ghosts of his own – a rich family history with secrets he never anticipated. Caelum’s great-grandmother was responsible for building a women’s prison that sits across the road from the family home. In letters and diaries that span several Quirk generations, gaps are filled and colorful characters come to life that at times seem to help Caelum come to terms with his childhood, while at other times serve to pose more questions than answers. However, what the reader gets is a real person who questions faith, family and fidelity (I love alliteration too much to let that one go) and is honest about how blurry the lines can seem when wrestling through tragedy. On a global perspective, from Columbine to Katrina, Caelum struggles on a personal level with issues our country had to face as well – a theme paralleled in his great grandmother’s dissidence with sending two sons off to the Civil War. I could go on and on with this review – there is so much I’m leaving out. Lamb’s writing is honest and beautiful. His turn of phrase is fresh. I’ll warn that there is some sexual language and scenes that might turn off a few readers. But most, I believe, will find this as rewarding as I did. Great review! Now I have another book to add to my list. ;D I read "She's Come Undone" several years ago. I don't remember much about it, other than I loved it and I thought for a male author he really seemed to portray a woman well. Does that make sense? Seems like it needs to go back on the list. I really enjoyed meeting you & your hubby last night. I look forward to having lunch. I'd love to hear from folks who read this….to know if it was listening to it that was so wonderful for me. I'm looking forward to She's Come Undone – and yes, even though this one has a male protagonist, Lamb is very insightful with his female characters as well. I read the book (not the audio) and thoroughly enjoyed this one. In fact I have never been disappointed by one of Lambs book. glad u liked it too. Thanks, Diane – I was hoping someone would say that! I'm looking forward to She's Come Undone, though with the stack of "have to be read" books, I probably won't get to this one until the beach. I thoroughly enjoyed She's Come Undone. I also felt like he wrote the famle character very convincingly. Equally well, I enjoyed I Know this Much Is True. I hadn't relized he had a new novel out and will look forard to reading that. Yea! Yes, Swestie – If you liked his other two, I can't imagine that you would love this one too.